WOW!! This is such a beautiful dress!! And the fur/jewelry is so extravagant and gorgeous!! INCREDIBLE. 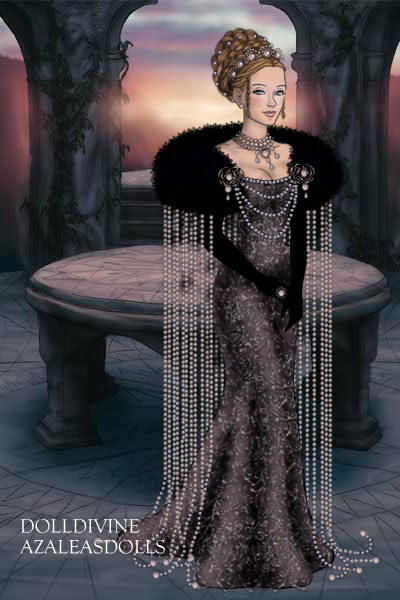 The dress itself is gorgeous but then you add the fur and the pearls and theta beautiful hair and it gets taken to another level. Just so lovely! Pretty! Pretty! Pretty! Pretty! Love this!! Wow. That is all I have to say. THIS IS SO PRETTY!!!!!!!!!!!!!!!!!!!!!!!!! This is so amazing!! I love the shawl!! O.o Dang, that is beautiful!! This is so gracefully done. Beautiful.